I don’t know how it happened. Time literally slipped through my fingers. As much as I am feeling the pain of lost days, my baby girl is experiencing the sadness even more. When I was her age, Christmas took forever to arrive. I am certain for her that date on the calendar is insignificant compared to another date she pines for every day. There is not a day that goes by in which she doesn’t lament how much she misses her big brother. This side of mothering is a terrible tight-rope walk. On one cliff’s edge is the fragile, beating heart of a little girl who misses her other half of the dynamic duo, who loves superheroes and Dr. Who as much as she does. On the other mountaintop is the man who was once our precious boy, scaling to higher and higher heights. Yes, I miss him every day, and I wish he were closer. But I also wish for him to soak up every experience offered to him, hoping his university years are as memorable and cherished as my own. In between the rock and the hard place, I tenderly cradle my girl while secretly cheering him on. We do hear from him, albeit not as regularly as his little sidekick would like. I can’t quite be certain, but I would not be surprised to see her create a public shaming encouraging video, like the mom who posted on Facebook explaining to her son how to use the phone to call home. I can see it now: E.T. wants to phone home, and sassy sisters want to hear from their big brothers. If I were honest with her, I could have known this is how his college days would be. I knew it fourteen years ago . . . on the first day of kindergarten. My theory is that children don’t really change all that much over the years. I knew on day one of kindergarten what move-in day as a college freshman would look like. I just didn’t want to admit it to myself. After taking our annual First Day of School pictures in our front yard by the tree near our driveway, we drove away anxiously anticipating a new adventure. The school district where I taught had just built a new K-12 building. We made the difficult and prayer filled decision to open enroll our children so we would all be in the same building with the same schedule. 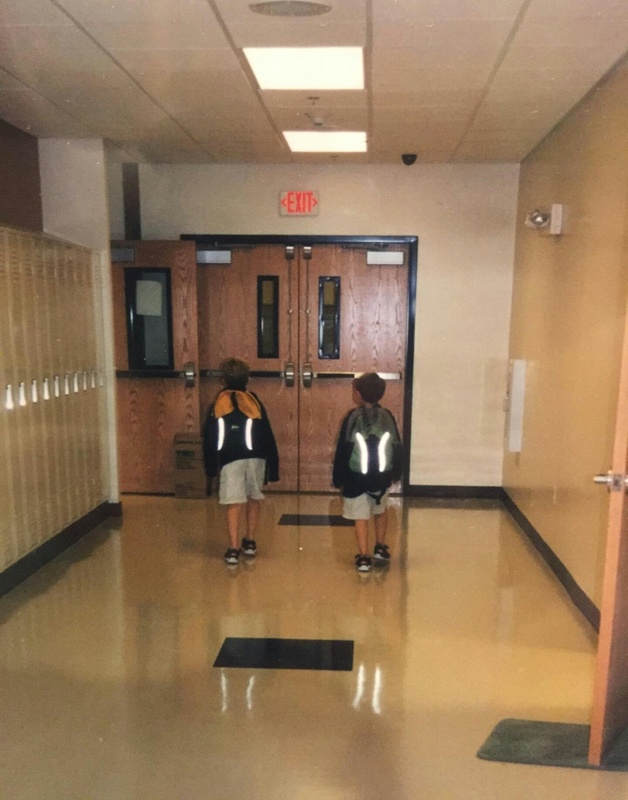 For Reed, it meant leaving his beloved Christian school, but for Sawyer it meant starting fresh as the first kindergarten class in the new school. I took a picture that day which is still my dad’s all-time favorite photo of my kids. Then we walked from my classroom to each of the boy’s. Reed’s entrance was fraught with a little more questionable outcome because these kids were not his classmates from the previous two years. A quick hug and more than a few prayers went up, as two of us walked on to the kindergarten room. I was hoping for a smooth entrance, but maybe not as a smooth as it actually was. I wanted to take in every corner of the excitement known as Kindergarten Room 1, but alas, my boy wanted nothing of it. We no more than stepped into the room when my chubby-cheeked, curly-haired boy spun around and told me, “You can go now.” WHAT? No hug? No photo of your name on the desk. No helping you put your supplies in your cubby. No putting away of your napping mat. No last minute pep talk by the locker. NOPE. Nothing! All I got was a “You can go now”, and he was off and running. He had people to meet, things to do, and a world to change! 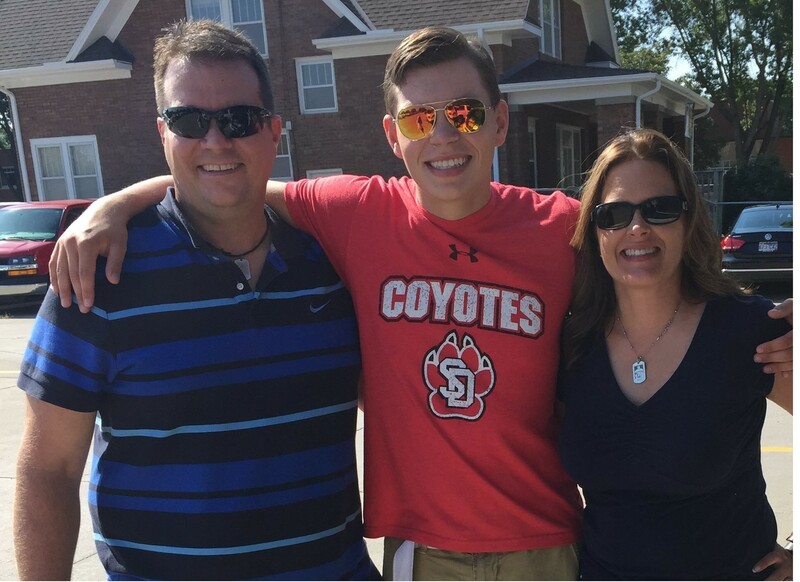 The whole drive to South Dakota to the college of his dreams, he and Sal and I giggled and enjoyed the three hour drive, while Dad and Sister were bringing up the rear with a mini-van full of what every college kid in America was hauling to campus. In my heart, I was trying to tell myself to savor the moment, because I knew it would be over quick, no matter how much I didn’t want to believe it. Going through the check-in process, we continued to rock out because somewhere he read to have your favorite jams because Move-In day can be long and tedious. They lied. It was neither. His university had the whole process down to assembly-line precision. From start to finish, I think it took less than one hour (which included getting his paperwork and keys in order, hauling all his belongings up three flights of stairs, and unpacking almost all of his items). As soon as the last box was unpacked, he had the same look he had back in Room 1. The look of a caged animal who knows he is about to be set free. Thankfully, we raised him to be a gentleman and he didn’t actually utter the words, but my heart knew what his heart was saying. . . Mommasita (yes that’s what he calls me) and Dad, I’ve got this! You can go now. He did at least allow us to get some pictures this time, even though I had to wait fourteen years to get one! And it is a good thing that we parents had on shades to hide the tears behind the dark glass. The best I can do is to savor each moment, because it won’t be that long before I will be sending my girls off to college. We will have to trust that we did some things right along the way, and that God has the rest covered. But hey! If my theory proves right, we might want to warn the university that we will have to peel one of the girls off of me, and I will be sending some of my students to check in on her to make sure the crying has stopped. But for now, I will cradle my sweet girl and together we will miss her big brothers – the ones in heaven and the one away at college. Oh those momma tears. I’ve been there, done that. 🙂 What a sweet story.